Ah, who can forget playing Pac-Man at the Pizza Hut. Or Joust waiting for a pizza at Noble Roman's. Or DigDug at Pizza King. Come to think of it... I ate a lot of pizza as a kid. 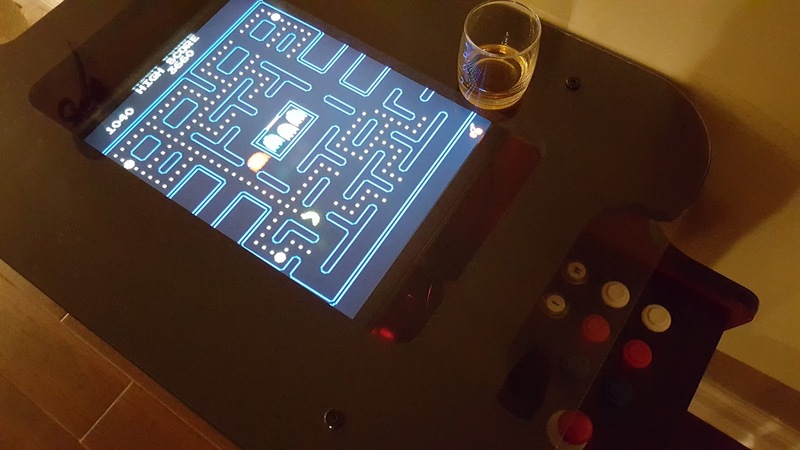 Fast forward to Christmas of 2014 - I purchased a arcade cocktail cabinet from Rec Room Masters. 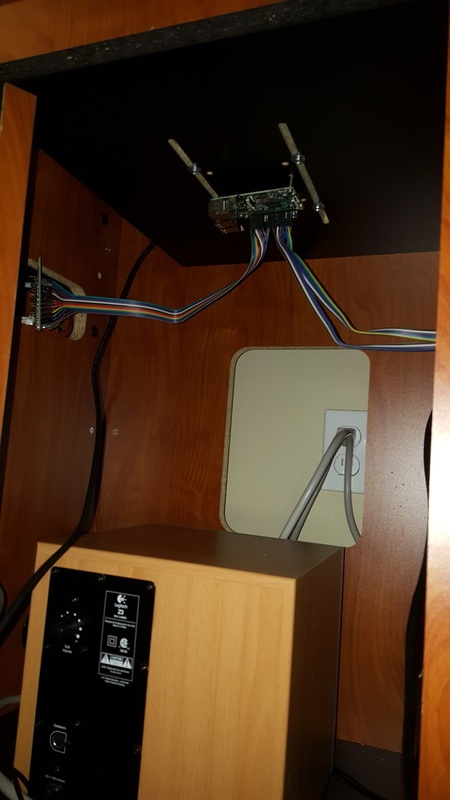 After it was assembled in Ikea-like fashion I mounted an old monitor, discarded 2.1 speakers and an Raspberry Pi 3 inside of the chassis. Nifty. 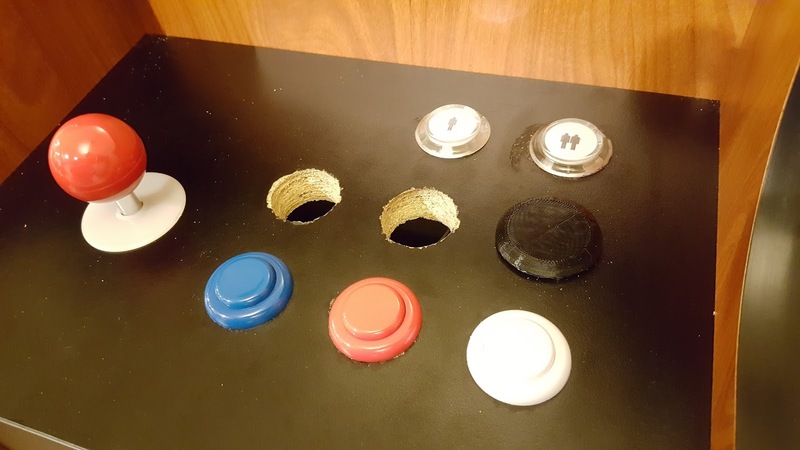 One oddity was that I didn't want to shell out all the cash for every single button in a panel... so I needed a cap for each remaining hole. Luckily I had access to a 3D printer, so was able to remix a hole cap on Thingiverse and print black caps to fill the gaps. I wanted the Raspberry Pi to sit a bit out of the way, so I screwed it into the VESA mount that the monitor rested on. After sawing an Adafruit perma-protoboard in half I was able to craft some custom headers that allow ribbon cables to connect from the Raspberry Pi and join with header posts for the joystick pins and buttons. This allowed for much better cable management and room for the subwoofer & speakers underneath. I wasn't interested in installing a coin door on one side - so I kept it wide open and instead had the cabinet door facing the center of the room. Little had I expected that cats would LOVE climbing in the open gap of the cabinet... and ripping cables off my Pi. I shoved the open side against the wall - allowing the extension cord to conveniently poke through - and now the only access is through the swinging door on the opposite side. On the software side, joysticks and buttons are mapped through mk_arcade_joystick_rpi, an archaically named but amazingly useful module that allows GPIO pins to become joystick inputs recognized by Linux. It took some work in order to have libretro recognize these buttons; many of them had to be remapped. However, libretro quickly became my go-to MAME emulator and now supports controls on both sides of the cocktail cabinet. I had to perform some slight modifications to the RetroPie display setup to rotate the screen 90˚, but luckily so many cocktail cabinet titles were programmed for this 4:3 aspect ratio. Titles are working flawlessly now, and I can host two-player action by flipping a few emulated dip switches. One thing I found interesting was how MAME distributions were entirely dependent on the exact name of your zip file. In addition, each ZIP was a true manifestation of the on-board arcade ROMs - in that sometimes a US distribution or second edition game actually piggybacked on top of a previous ROM. In this same way, two ZIPs were sometimes required to run a single title: one for the older ROM, one for the later version. I ended up combining the two ZIP archives into a single one - in this way older ROM images were still injected as a dependency, while the ZIP name was that of the older title and was still executed correctly. Pizza night at the household now takes on an entirely new meeting. A few slices and a frosty beverage helps me appreciate Ms. Pac-Man in a whole new light.